To create this Almond Vassilopita Cake with a superior almond flavor, I used finely ground toasted almonds, which added a more profound almond flavour. Vassilopita is a traditional Greek cake or bread with a coin inside, named after St. Basil, which is made for New Year’s Day. Vassilopita is made in two ways. One is a sweet kind of brioche bread called “tsoureki” and the other an orange flavoured cake. 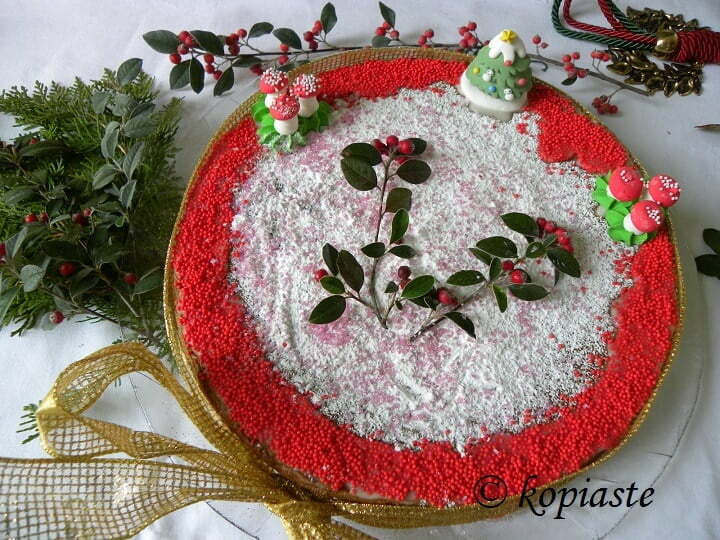 To read the tradition for this cake you can read my first post for Vassilopita. Last year’s Almond Vassilopita was amazing but this year I decided to make it with lots of almonds and less flour. I blanched the almonds and while preheating the oven, I lightly toasted them. This was done to remove the moisture of the wet almonds but also toasted almonds have an amazing flavour. I used the dry ingredients to pulverize the almonds, in order to make my own almond meal. I made it in three batches. Be careful not to pulse them too much, three or four times is enough, in order to avoid making almond butter. It will be a bit grainy but this doesn’t affect the texture of the cake. To decorate the cake I started by sieving some icing sugar on top. I then added the Sugar Icing using a piping bag to form the border on the edge where I placed the edible ornaments. The icing helps them glue on the cake. I made the sugar icing with 1/2 cup icing sugar and about 2 tbsp lemon juice. On the remaining sugar icing I put the red round sprinkles in a plastic bag where I cut a small hole at one of the corners. This helps to spread them easily. I then sprinkled some edible pink crystal sugar on the remaining surface. The taste was amazing, without it being overly sweet. Even the edible decorations were delicious! You do not need to wait until next year to make it as it is a perfect coffee cake. Mix the dry ingredients (flour, salt, baking powder, baking soda and lemon zest). Line a 10 inch (26 cm) cake pan with parchment paper and grease the parchment paper and sides of the pan with the 15 grams of melted butter. Melt the butter in the microwave, one minute each time, until it completely melts or you can melt it in a frying pan on low heat until it melts. Set aside to cool but not to set again. Whisk the egg whites with lemon juice until the egg whites become stiff. In a separate bowl cream the egg yolks with sugar for about five minutes, until the mixture becomes creamy (I used a hand mixer to do it). Add the melted butter in a steady stream, mixing until incorporated. Add vanilla and mix to combine. Turn off the mixer and using a spatula, gently gradually fold in a little of the almond – flour mixture and egg whites each time, until all is incorporated. Empty the batter into the cake pan, spreading the batter up to its rim with the rubber spatula. Wash a coin, wipe it and wrap it in aluminium foil and put it in the batter. You can decorate it just with icing sugar using a stencil, which is the traditional way, or use royal icing, buttercream or fondant to decorate it. Turn off the mixer and using a spatula, gently gradually fold in a little of the almond - flour mixture and egg whites each time, until all is incorporated. with the hope that you will have many blessings in the new year! wow..I am really impressed, Ivy. The cake looks so beautifully decorated and amazing! Thank you Angie. Same to you! Happy New Year Ivy. This cake looks really good.